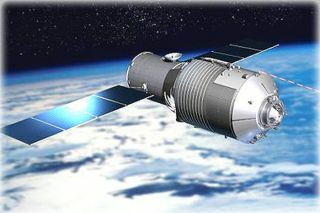 Artist's illustration of China's 8-ton Tiangong-1 space lab, which is expected to fall to Earth late next year, unless it's boosted to a higher altitude. The United Nations Office for Outer Space Affairs (UNOOSA) has reissued a notification by China on the future uncontrolled re-entry of the country's robotic Tiangong-1 space lab, which is expected to take place in the next eight months. A follow-up update from the Aerospace Corporation predicted the space lab could fall to Earth as soon as February. The lab's re-entry is expected between October 2017 and April 2018, according to the U.N. The Aug. 2 notice from the Aerospace Corporation pegged re-entry as occuring in January 2018, with a margin of two months on either side. According to the calculations and analysis that have been carried out, most of Tiangong-1's structural components will be burned up during the craft's re-entry into Earth's atmosphere. Altitude history of China’s Tiangong-1 space lab. Editor's note: This story was updated Aug. 6 to include new re-entry predictions from the Aerospace Corporation.